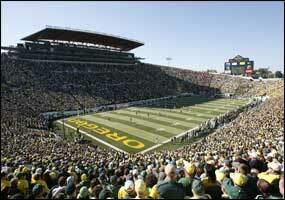 Where the cash for athletics is earned: Autzen Stadium as shown on GoDucks.com. Once again there’s talk in the NCAA of possibly paying college athletes for their work. The argument against it is that the athletes are getting a more or less free education, and that should be enough. It’s a dubious argument considering that participation in top-flight athletic programs is a year-round obligation that doesn’t leave much time for a serious study. The argument for paying athletes is that many others are raking in buckets of money even though they risk nothing on the field or the court. At Oregon, other people earning excellent salaries based on sports include the athletic director and head basketball coach, who each got $450,000 last year, an assistant basketball coach at $300,000, two other basketball assistants at $250,000 each, the head baseball and men’s track coaches at $200,000 each (the same, by the way, as the university’s lawyer), an associate athletic director at $192,000, an executive senior associate athletic director at $190,000, an assistant football coach and an assistant coach for defense at $189,625 each, a head strength coach and the head women’s volleyball coach at $175,000 each, and so on. I stopped counting when I got to an assistant baseball coach who made $134,550. Twenty-seven members of the U of O athletic staff made more than that. The players, especially the football ones, are very well compensated. They’re allowed to graduate and attend the very minimum of classes; when they are on the road they get a very healthy per diem allowance; and they get to use exclusive training facilities. They are paid in perks. Here is a link to an excellent article on the issue. College players are paid, and handsomely I might add. If you still think their pay is not enough, perhaps you should direct your concerns to those mostly responsible for the current situation – the professional leagues.